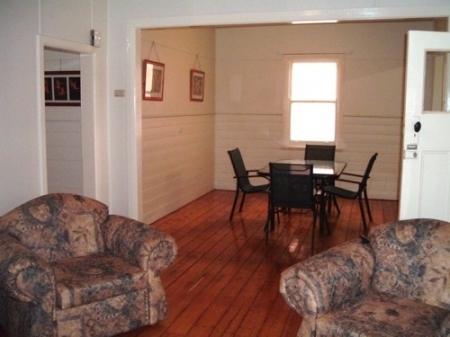 Is a circa 1920s 2 bedrooms Miner's Cottage. The exterior of the building is typical of it's era and is in the corrugated iron style common to this area. This style of construction was popular in Broken Hill due to the extreme cost of transporting bricks from South Australia. It was an affordable way of obtaining home ownership. Most Australians are unfamiliar with this concept, having been raised on the notion that a house has to be made of brick in order to be "solid". In Broken Hill "solid" construction is prone to cracking problems due to the mine firings, over time this becomes a major issue as the cracks get bigger, as does salt damp. The vacation rental property is fully fenced including a dividing gate between front and rear yards. The front yard is dominated by 3 huge "Bird of Paradise" plants. The walls are lined from the floor to the 4' level with floor boards. This was again typical of its era, was very durable (compared to fibrous plaster) and was a bonus for us to find them still in situ as normally they are torn out over the years and replaced with Gyprock. The floors are the original timber and have been polished and sealed. The rear yard is predominately lawn. 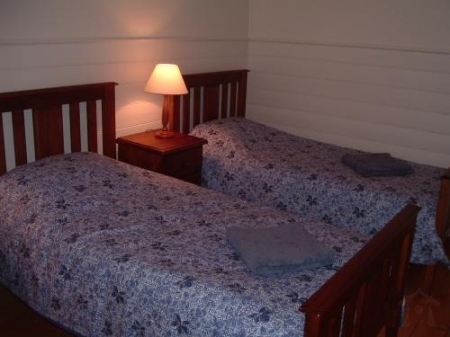 Per Night = $99 to $118 per cottage for 1 or 2 persons. Per Week = $535 to $595 per cottage for 1 or 2 persons.